*Dress- new, never worn, with tags still, size 2 but I wear a 3 and it was a little big. 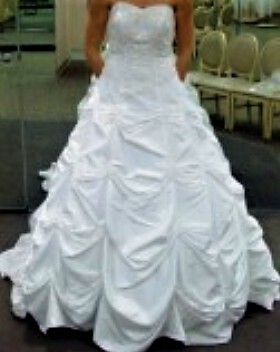 IT has never been altered and is a white strapless, taffeta, A-line, sweetheart neckline, lace/embroidering and sequins/beading on the bodice (top), pick-ups (bunches) throughout the skirt, a chapel train, and a zip up back. I paid $650 for the dress. and *Garment bag- David's bridal side zip solid white bag that I bought (as an extra charge) with the dress.